What if all those apps you rely on at work weren’t trapped on your smartphone’s tiny screen? They may not be for much longer. 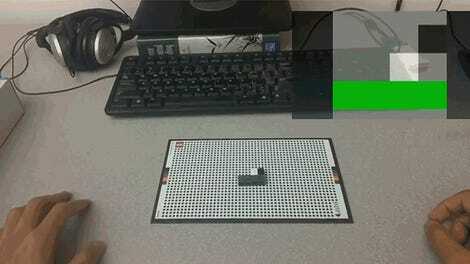 Researchers at Carnegie Mellon University’s Future Interfaces Group lab have come up with a novel way for your smartphone to spill out onto your desk while still letting you interact with apps you rely on using your fingers. In a paper that will be presented at the Symposium on Engineering Interactive Computing Systems in Lisbon, Portugal (pre-print available here), Ph.D. student Robert Xiao details his “Desktopography” prototype, which uses a custom camera-equipped overhead projector to cast an interactive Android smartphone interface onto almost any surface. Back in February, Sony demonstrated a similar technology with a short-throw projector that could create an interactive screen on a flat surface. Xiao’s research takes that idea even further. 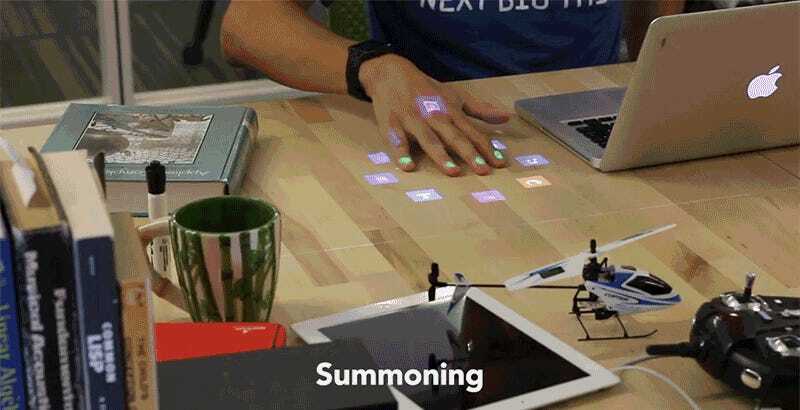 His projected apps, generated by a self-contained projector with a built-in Android computer, aren’t limited to just a rectangular screen, but can instead be dragged around a desk, resized using multi-touch gestures, minimized to icons, and even rotated for improved ergonomics. The interface will also work on non-flat surfaces, facilitating those telecommuters who prefer to work from bed. The virtual apps can also be docked to the side of physical objects, like attaching a calculator to the side of a laptop, which moves wherever the computer does. And the system is smart enough to automatically reposition apps when something gets in the way. If a co-worker carelessly puts their mug of coffee down on your virtual notepad, the app will move itself to the nearest open space so that you can still see it, and still interact with it. What’s probably the most innovative part of Xiao’s technology is the projector itself. It’s completely self-contained and designed with a standard lightbulb screw connector on the end, so installing it is as easy as replacing a lightbulb. Multiple projector bulbs could be installed throughout a house and synced via the home’s wi-fi network, letting users move from an office desk, to the kitchen, to the dining room table, while still having access to all of their apps and files. It sounds like total science fiction, but we already have all of the technologies needed to make this work, they just had to be cleverly merged like Xiao has done. You won’t even have to worry about your virtual smartphone dying, because the Desktopography hardware draws all the power it needs from the bulb socket. Aside from the projector itself, the only other hardware you’d need to use it is a lamp placed close to where you want to work. So you’re just one IKEA trip away from making your desk feel like something out of Star Trek.